I’ve wanted to get my hands on this car for a while because it was a serious contender for a spot on my driveway. It’s a good looking car that’s often been touted as one of the best hot hatches on the market. I was very worried that the Fiesta ST would make me regret buying an Abarth, thankfully it didn’t but now I completely understand all the hype that surrounds this car. The new Fiesta looks great, there are all these sporty touches across the car that really make it look the part. If you’re looking for something really spectacular when it comes to styling, you’re not going to get it with this car but for anyone who wants a fierce little hatchback, that’s exactly what you get. 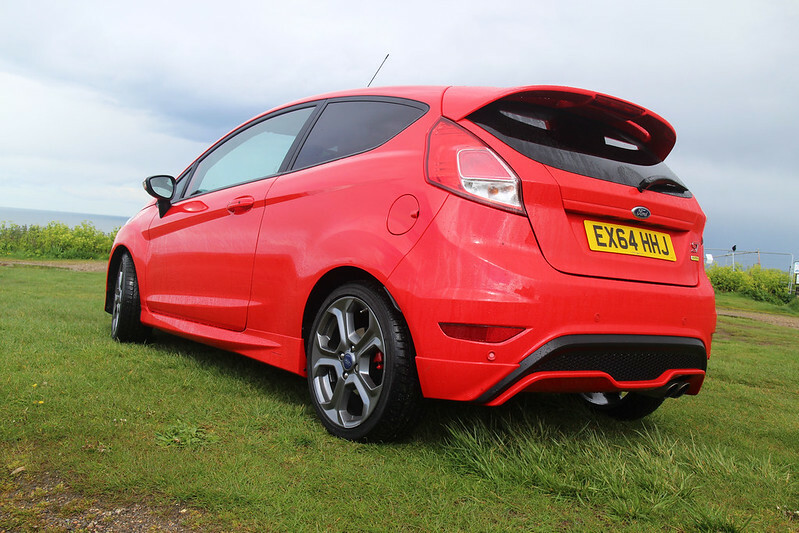 I think the standard Fiesta is pretty good looking but the ST has 17″ alloys, a little spoiler, slightly lowered ride height, body kit and privacy glass, making it look tough and ready to race. You can’t move for ST badges in this thing so no one is ever going to be able to deny that you drive a sporty version of the most popular car in Britain. 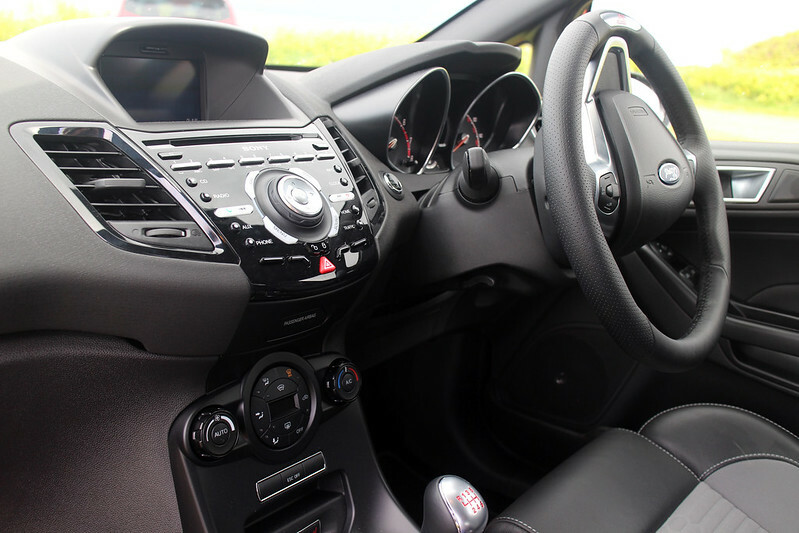 As we’ve come to love and expect from Ford’s hot hatches, you get lovely Recaro sports seats. These are nice and snug, meaning you can hoon your way around a corner and not move too far from your original driving position. They’re also comfortable enough for a lazy Sunday drive. The centre console is a little fussy with lots of buttons but you don’t really need to worry about any of them as you drive. Once you’ve got the hang of that centre dial and the buttons surrounding it, you can control everything from your music to the satellite navigation. I found the sat nav to be a little confusing, which led to a few wrong turns but it will get you to where you need to go (eventually). With only three doors, the Fiesta ST doesn’t rate that high in terms of practicality but there is a lot of interior space. If you can look past clambering over those front seats to get to the back of the car, there’s plenty of room for two adults (or lots of road trip luggage) in the back. There’s also a decent sized boot that will easily fit golf clubs in the back (why is that the standard measure of a car’s space? I can confirm that the boot fits one six-foot-plus human male inside – this is the new standard). The ride, as with many hot hatches, is a little bumpy because of that stiffened suspension. I’d heard that this car wasn’t really practical for every day use due to how uncomfortable the ride is but I’d have to disagree. You can feel every bump but it’s not so jarring that you couldn’t drive it quite comfortably on a daily basis. 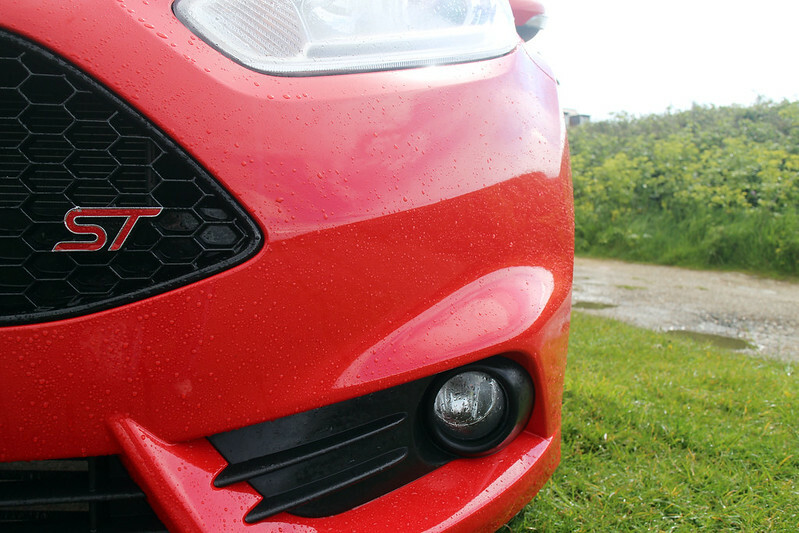 This is where the Fiesta ST shines. It’s a spectacular car on the road. There’s tons of grip, an almighty roar in high revs and you can put your full trust in it at speed. I’d love to take one of these on a track to really put it through its paces but I had to make do with motorways and country lanes. Still, I got a real feel for the sheer power coming from the Mountune setup. The Fiesta ST Mountune upgrade takes the car from 182PS up to 215PS, which brings the 0-62 time down to 6.7 seconds – seriously quick for a hot hatch! The Mountune upgrade gives the car a remodelled air box with secondary inlet, high flow air filter, and a unique ECU calibration. The best thing about this upgrade is that it can be fitted at any time for just £599. 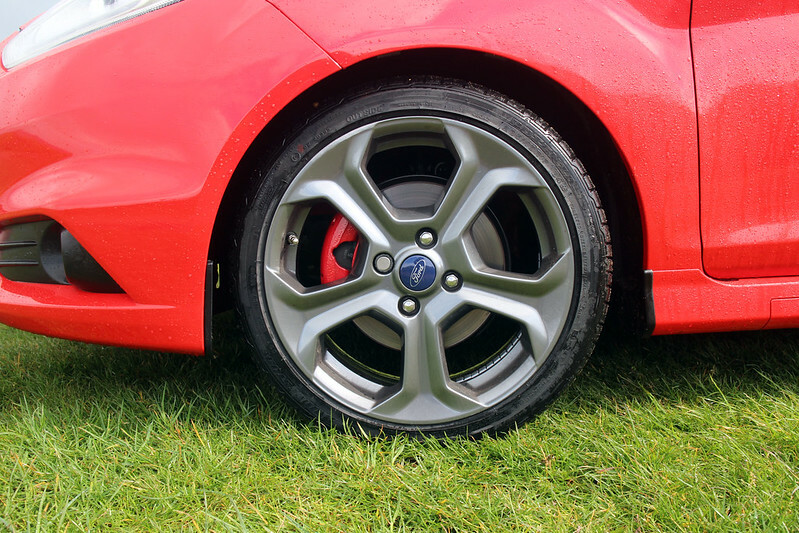 That means all you current Fiesta ST owners can tune your car without voiding the manufacturer’s warranty! 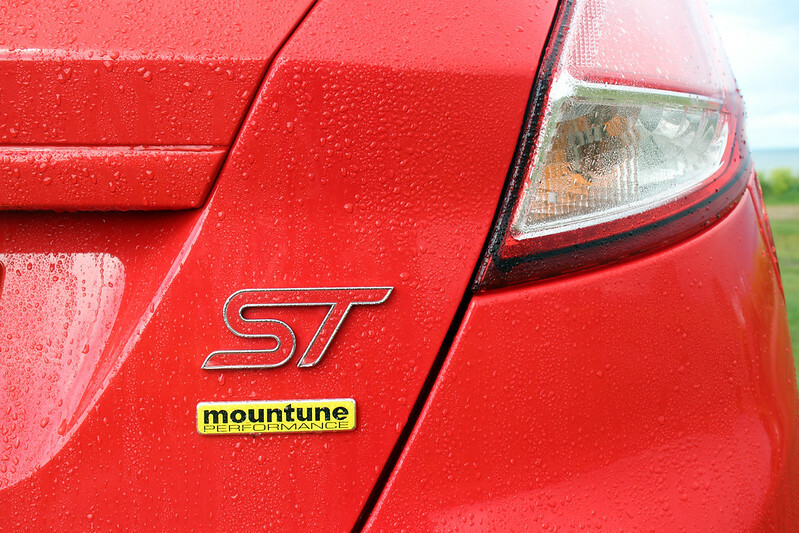 The Mountune upgrade is also available for the Focus ST, turning what is already a beast of a car into an absolute monster! Despite all this performance, the Fiesta ST manages to stay reasonably economical with a combined MPG of 47.9. Thank you EcoBoost. If anyone asks me what I think about this car, I won’t stop gushing about it. It lacks the personality of my Abarth but it performs above and beyond any car with a similar engine and set up. I think if you were to ask me what hot hatch I’d recommend for road and track use, I wouldn’t hesitate to recommend the Fiesta ST Mountune version. It’s not very often I drive a car and only have positive things to say about it so feel free to take that as another thing that just adds to the Fiesta ST’s charm. What does it cost to lease a car? Great article, as an owner of an ST-2 I can confirm it is supremely good fun to drive and a whole lot of car for the money. Looks great, goes like sit off a sovel and is packed full of great technology. Heated Recaro seats are a particular favourite, and I can fit my road bike in the back… I love it as much now as when I first I picked it up 8 months ago! I have to say. I’m very fond of those Recaro seats. I wish my Abarth was as comfortable to drive as the Fiesta!